"Strong tides and storms can change beaches significantly. On this particular visit a limestone ledge running along the shoreline, which had not been visible on a previous visit, had been revealed. Mid-winter is a great time to visit the beach at Burton Bradstock. 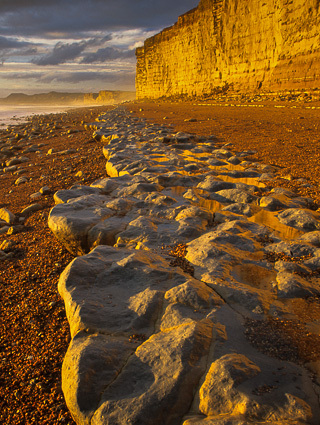 At this time of year the low sun to the south illuminates the southward facing sandstone cliffs to the best effect to give a wonderful golden glow. On this particular day the sun had kept hidden until the very end of the day, appearing in a narrow gap between the clouds and the distant horizon just before it set that day."